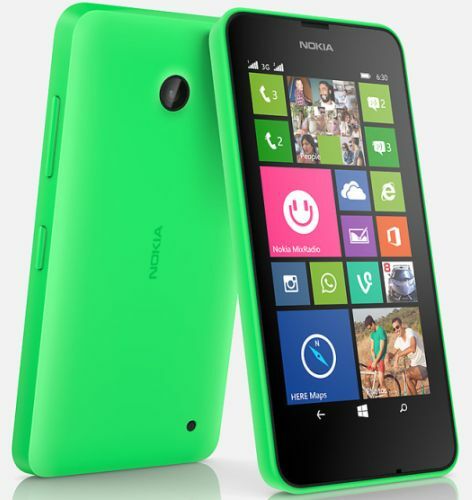 Nokia has launched its new smartphones Nokia Lumia 630 and Lumia 630 Dual SIM in the Lumia series in India. Both smartphones feature 4.5 –inch FWVGA ClearBlack IPS display with Corning Gorilla Glass 3 protection. Lumia 630 runs on the latest Windows Phone 8.1 OS and powered by 1.2 GHz quad core Snapdragon processor with 512 MB of RAM. Lumia 630 comes with a 5 megapixel rear camera with 720p video recording, autos focus and burst mode and there is no front camera. The phone has 8 GB of internal memory and external memory up to 32 GB using microSD card. The device is packed with 1830 mAh battery that provides 13 hours of talktime and 25 days on stand by mode. The Phone has Windows Phone 8.1 OS with the Dual SIM support and this the first dual SIM Windows Phone device that offers call waiting and call forwarding between two SIM cards. There are many useful apps preinstalled in the phone including Bing Health and Fitness, Microsoft Office, Nokia Camera, Nokia MixRadio and Here maps. Nokia Lumia 630 Single SIM is priced at Rs. 10500 and Dual SIM variant is priced at Rs.11500. The Dual SIM version will be available first from May 16th 2014 and single SIM version will be go on sale later this month. You can get special offers at launch including 1 GB of 3G data for 2 months for Vodafone customers, 2 month Box TV subscription and Flipkart ebooks worth Rs.2000.